A comprehensive introduction to architecture and architectural history and exceptional in its approach, this book explores architecture as a current practice in relation to history and in relation to the wider context of cultures, conservation and the environment. This new edition brings in the new emphasis on sustainability, urbanism, urban regeneration and cultural identity, in order to take a holistic approach to the subject of architecture. 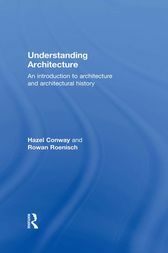 Highly illustrated, this book enables the reader to make sense of the experience of architecture and the built environment by understanding more about the form, construction, meaning and history of the subject.